The death toll from the tsunami believed to be triggered by a volcanic eruption in Indonesia on Saturday has reached at 222 people while over 800 have been reported injured the tsunami hit at least nine beach hotels hundreds of houses and a group of people attending a beach concert during the long holiday weekend. 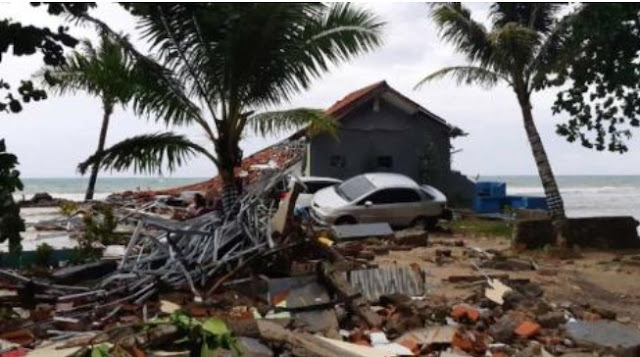 Around 28 people have been reported missing after the tsunami hit around the Sunda Strait on Saturday night the disaster management agency said the toll could continue to rise because some areas had not yet been reached. Scientists including those from Indonesia’s Meteorology and Geophysics agency said Sunday that the tsunami could have been caused by undersea landslides or those occurring above sea level on the Anak Krakatau volcano’s steep outside slope following the eruption the volcano’s name translates to Child of Krakatoa a volcanic island formed over years after one of the largest eruptions in recorded history occurred at the Krakatoa volcano more than a century ago the scientists also cited tidal waves caused by the full moon. The death toll includes the scores of people attending a concert by Indonesian pop band named Seventeen at a popular beach as well as hordes of tourists visiting th island nation during the long weekend before Christams, The Anak Krakatau volcano lies in the Sunda Strait between Java and Sumatra islands, linking the Indian Ocean and Java Sea. It erupted about 24 minutes before the tsunami the geophysics agency said. 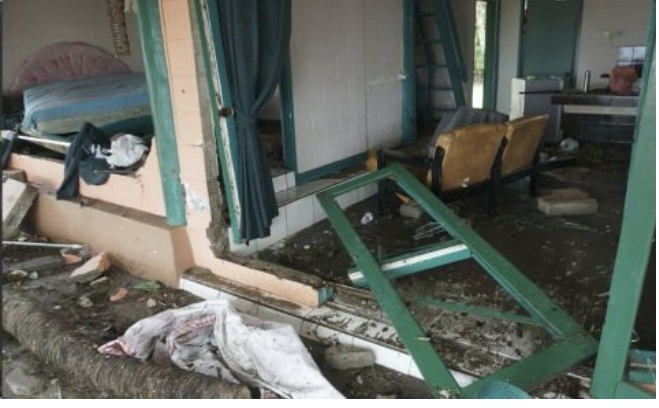 The worst-affected area was the Pandeglang region of Java’s Banten province, which encompasses Ujung Kulon National Park and popular beaches, the disaster agency said. 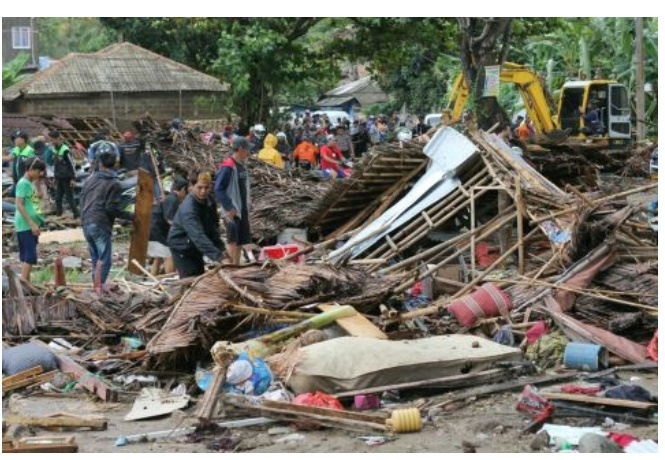 Agency spokesman Sutopo Purwo Nugroho said 222 deaths had been confirmed and at least 843 people were injured. Rescue workers were still trying to access other affected areas. Indonesian President Joko Jokowi Widodo expressed his sympathy and ordered government agencies to respond quickly to the disaster My deep condolences to the victims in Banten and Lumpung provinces he said Hopefully those who are left have patience the 305-meter 1,000-foot high Anak Krakatau volcano, located about 200 kilometers 124 miles southwest of Jakarta, Indonesia’s capital has been erupting since June. In July, authorities widened its no-go areas to 2 kilometers (1.2 miles) from the crater gegar prasetya co-founder of the Tsunami Research Center Indonesia said Saturday’s tsunami was likely caused by a flank collapse when a big section of a volcano’s slope gives way. He said it’s possible for an eruption to trigger a landslide above ground or beneath the ocean, both capable of producing waves. Indonesia prone to earthquakes tsunamis Indonesia a vast archipelago of more than 17,000 islands and home to 260 million people lies along the Ring of Fire an arc of volcanoes and fault lines in the Pacific Basin in September more than 2,500 people were killed by a quake and tsunami that hit the city of Palu on the island of Sulawesi which is just east of Borneo saturday’s tsunami rekindled memories for some of the massive magnitude 9.1 earthquake that hit on December 26, 2004 it spawned a giant tsunami off Sumatra island in western Indonesia killing more than 230,000 people in a dozen countries the majority in Indonesia.